Parts aren’t all the same, as we all know. 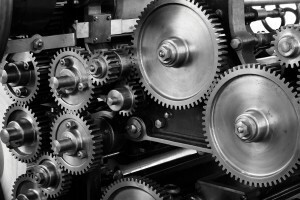 A component from one manufacturer might not match the quality of another so how do we ensure we are getting the best products? One way is to source them from a good, reputable supplier so what do we look for in a high quality parts provider? ‘The best quality, the best price and availability,’ are what Keith O’Bryan from Carlyle Bus and Coach says should be sought after by operators looking for parts. This is certainly what the company strives to provide. He says they should also look for a supplier that can supply it ‘when they want it’. Keith notes this is a ‘poorly documented’ industry, in that there are not as many records of what parts are required as would be desired. However, this is not a problem for Carlyle, with Keith explaining the company has considerable amounts of industry knowledge and as such, does not always need the chassis number. This expertise emerged from the days of Midland Red as a 2000 vehicle operator, the supplier having its origins in that company’s central stores department. One of its biggest strengths, Keith said, is its response to distress purchases, ‘Not the parts you change on an annual basis, but for when you get a brick through your window or a bent panel’. This requires them to deliver products quickly. 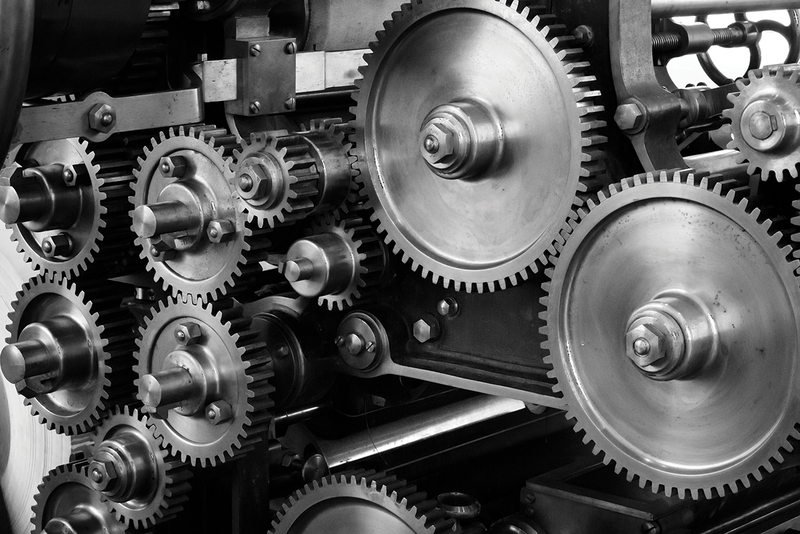 All moving parts tend to have some form of wear and tear, so replacements are just a necessity. Having perhaps one of the most well known names in the world of bus and coach parts suppliers is Heavy Duty Parts. The company was founded by members of the original team who introduced Neoplan into the UK in the early 80s, through the original importer Carlton PSV. It benefits from global supply routes, which have come out of the relationships it developed over this period. One of the aspects that sets the company apart is its focus on PSV components, specialising in this area. The company stocks what it calls a comprehensive range from chassis and engine parts; exterior panels and bumpers to interior fittings and trim. It has the ability and resources to supply the component required using only the vehicle registration number. Being a genuine Irizar parts supplier, the company’s comprehensive range of components from this marque includes its most commonly supplied items. Mirrors and lighting products are especially fast moving and the good stock availability of genuine Irizar parts is essential for ensuring sufficient supply. A small selection of parts supplied by Moseley PCV. Dave Sellars. ‘Easy identification and quick turnaround of parts so that vehicles spend a limited time OTR,’ is what operators should be looking out for in a components supplier, Dave said. The manufacturer offers a free next day before 12.00 delivery service. It can also identify the parts that vehicles require based on the vehicle identification number (VIN), this information is also available through the exploded diagrams within its online parts portal that customers can register to access and also order parts directly from. Optare supplies genuine OEM components and its online parts portal is designed to make it easy to look up vehicle parts by model type. The portal contains information such as servicing manuals and technical bulletins and recommendations. Dave said online ordering also helps when planning work around parts delivery as it shows stock availability. It is not completely tied to its website though, it has a dedicated customer helpline operated by its engineers to assist customers with fault finding and trouble shooting. Dedicated telesales staff also help with parts identification and ordering and Dave said the department currently operates at a 95.6% first pick rate. ‘If you’re an operator, then you should expect expertise from a parts department.’ He emphasised there should be a rapid response in identifying and distributing items required. ‘Meticulously,’ is how Marc said the company stocks its parts. Arriva can offer an imprest stock service, which sees a range of components kept in store specifically for individual customers. The management of this is down to a mutual agreement, which is often checked on a bi-monthly basis. Despite the fact it is part of Arriva, it does supply parts to the other big bus groups, having contracts with some of them. It has a field service side to its business as well, which has won a tender to be the approved installer of equipment to bring vehicles up to ULEZ standards. Established in 1993, Direct Parts initially specialised in supplying power steering and hydraulic fan equipment. However, its product range has further expanded to include front and rear axles, calipers, compressors, steering columns and linkages. Its website says vehicle manufacturers supply its range, which it claims further endorses its portfolio within the UK and beyond. All companies within the Direct Group are registered to the ISO9001 certification. It has its own fleet of vans that delivers into London daily and it constantly manages its stock profile to ensure it has ‘the right parts on the shelf to be able to respond quickly’. PSV has ‘always put emphasis on having an understanding of not only the individual parts but also the complete systems that they fit’, according to Martyn. He said the company has ‘unrivalled technical backup’. For starter motors and alternators, it has accounts with the main manufacturers, including Prestolite (PSV is the largest distributor in Europe), Bosch and Delco Remy. It also has its own remanufacturing workshop for these brands. Having bought the intellectual property for Deans and Peters doors following their collapse in 2010, it now manufactures complete doors and ramps. It has over 2,000 powered ramps fitted to buses as OE in London (including every New Routemaster apart from the first six) and hundreds more manual ramps across the country. 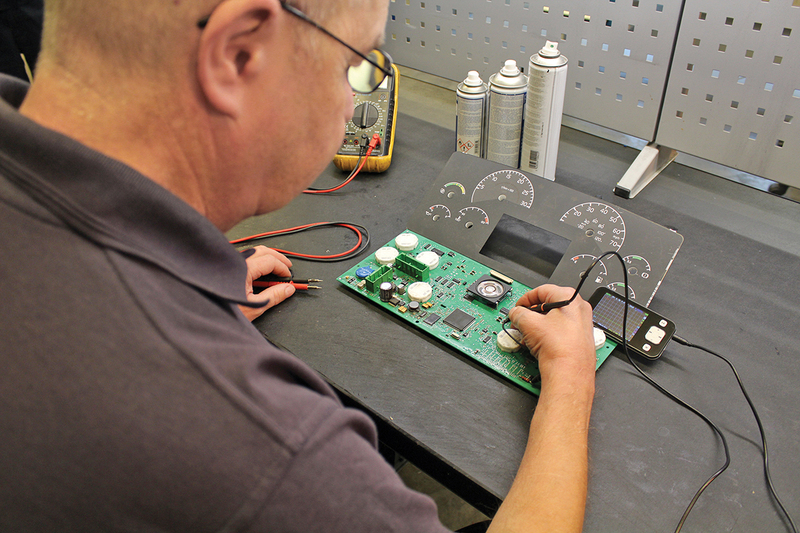 Martyn said, ‘Operators are specifying our systems partly because they are superior to other systems in the market and partly because of the support we offer in the aftermarket.’ In addition to this, it has a repair workshop for these products, in addition to its own electronic repair department. It offers refurbished electronic equipment, such as dashboards, speedos and gear selectors etc. Its sister company, J.Lewis Auto Electrical (www.jlae.co.uk), offers field support and backup for all the parts and systems it supplies. 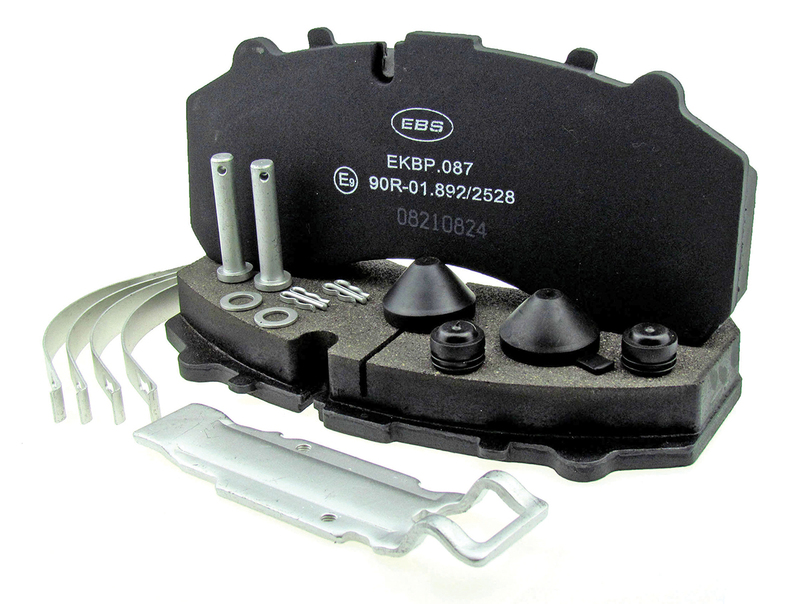 Brake components are the speciality of EBS. 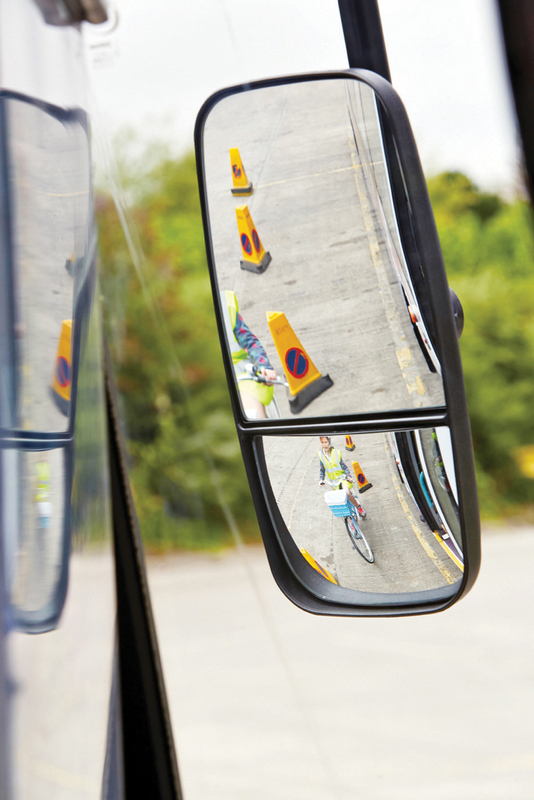 Ashtree Vision and Safety’s CycleSafe mirror. 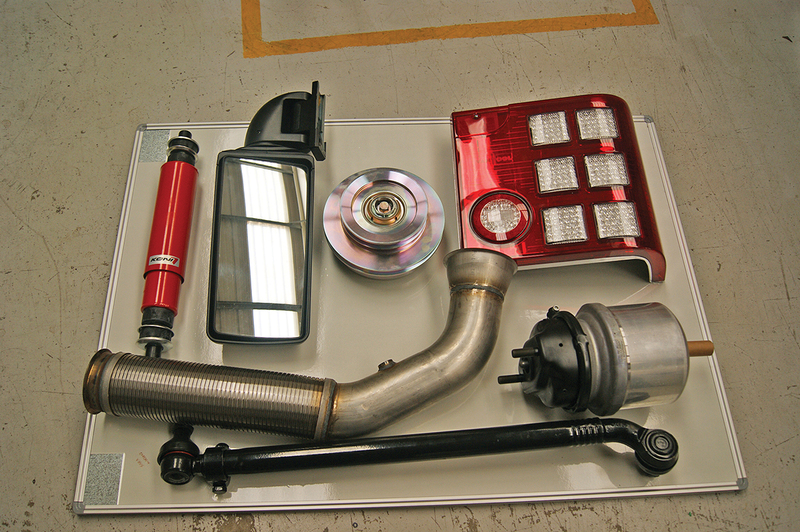 PSV Transport Systems not only supply parts, but also have workshops to support the products it provides. John can look after any part on a bus or coach, with chassis components one area it most commonly provides. The company was set up 25 years ago, originally providing parts for Leylands. However, it has moved with the times and now provides parts for various makes and models. Aftermarket Sales Manager at Grayson Thermal Systems, Richard Harris, with the company’s Thermo King Award. 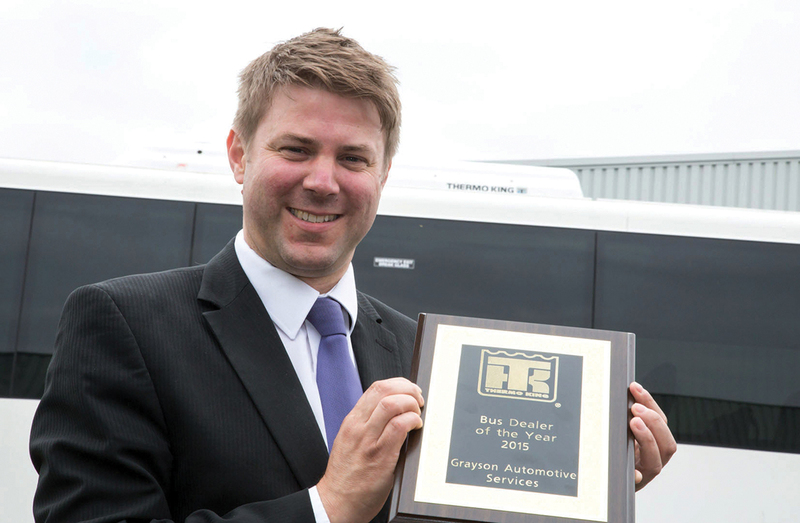 One of the most popular products at the moment for Grayson to supply is the Drivers Air Conditioning System. This is a hermetically sealed roof top air conditioning unit, which is fully electric and has a five year warranty for all parts. The only servicing required over this period is the cleaning of the filters. Polybush supplies various polyurethane bushes. ‘All vehicles have what we call a problem bush,’ according to Polybush’s Anthony Kidd. These are the suspension bushes that wear first and are often fast movers from the company’s stock shelves. 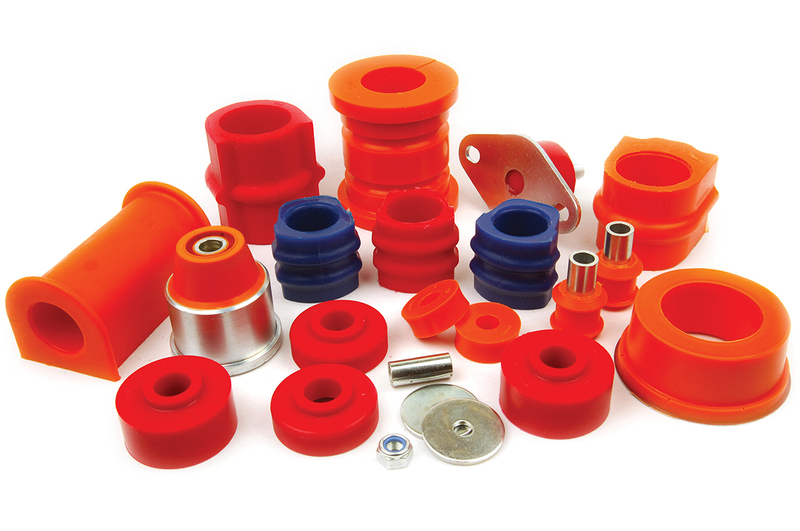 The casting technique Polybush uses is what sets it apart from other suppliers of polyurethane bushes, according to Anthony. The company uses hand casting, as opposed to injection moulding, which sees the company mix the polyurethane in-house and pour it into the moulds themselves. This, Anthony said, helps reduce air bubbles in the substance. 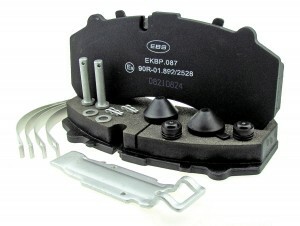 Testament to the quality of its castings is that they are used as OE by manufacturers as well as in the aftermarket. One of its most popular products into the bus and coach market are what it calls its ‘top hat bushes’, which are essentially two bushes that can be pushed together, enabling an easier fitment. Engine protection and performance design engineering product supplier, Agriemach, is about to promote its AdBlue fuel storage and dispensers. David Kallmann from the company said the market for this product is now even bigger, with Euro6 meaning more vehicles use it. David expects more operators to start having their own AdBlue tanks. They are supplied to ISO standards, being ‘one of the few’ to supply products of this standard. Other products it supplies for this market are heat and sound insulation products, as well as offering a range of fuel filtration devices for combating diesel bugs. Dave Miles at bus and coach pre-heater parts specialist, THHS, said the emphasis is on providing OE quality parts where they can. He said, ‘It’s all about trying to find the right product for the right customer.’ Next day delivery is aimed for by THHS, keeping ‘comprehensive stock’ to be able to do this. Its best selling product is heater motors. What operators should be looking for is value for money, according to Truckapart’s David Law; that and reliability. Generally, good availability of components is something else highly sought after. David said his operation is part of an independent transport company, a family run business, which he notes is like many operations in the coach and bus world. It supplies a lot of brake discs and pads, as well as clutch parts.